I love this whole look! The top is everything! I had no idea you were a sahm! Love the I can drink as much wine as I can comment, ha! 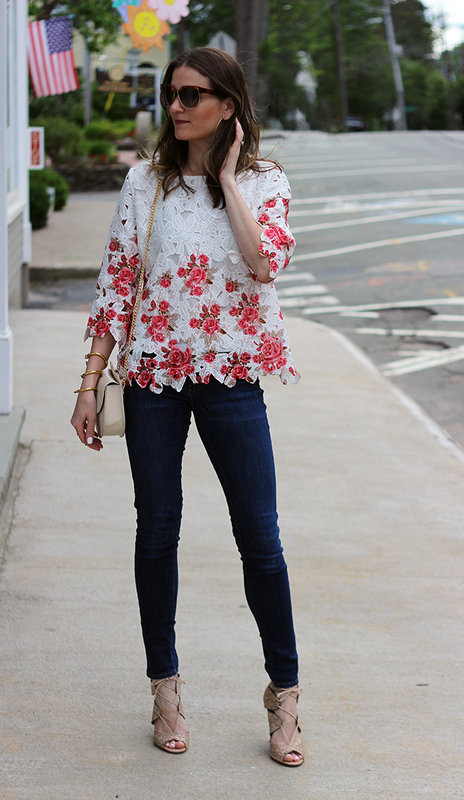 This lace top is SO pretty, love the pop of color the floral print adds. That lace top is stunning! Love this whole look! Thank you for the linkup and have the best weekend! Such a pretty top! It looks great with the skinny jeans! Love the exquisite details of the top!!! Come check out how I welcomed Summer at the blog with a boho-inspired look - Happy weekend! 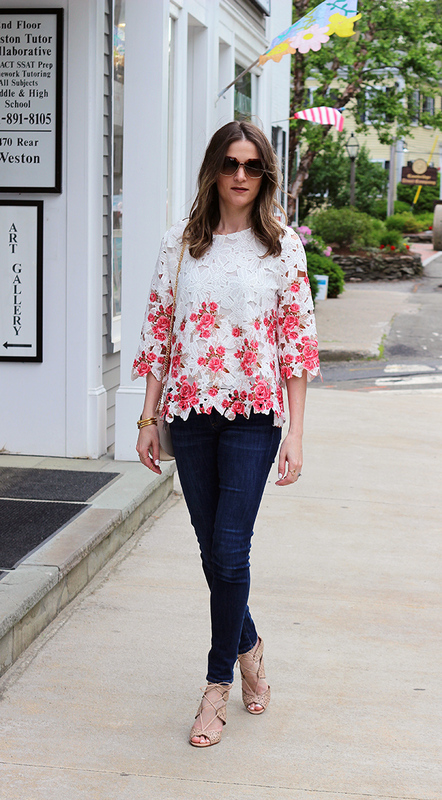 Dark skinny jeans are the perfect pairing for this pretty top! I am crushing on lace too. What a nice top. I hope your Friday and weekend is amazing. My mouth is dropped open and drooling over this top. Gorgeous. It's so feminine with the lace and roses, but the fit itself is "I am cool and not trying at all." Love it. Here, here to Friday's and having a glass of wine on the deck and just chilling with the family. Enjoy your weekend. That top is super amazing, two of my favorite thing on one top. Wow! What a gorgeous top! Lovely top and amazing shoes! I am a shoe freak! 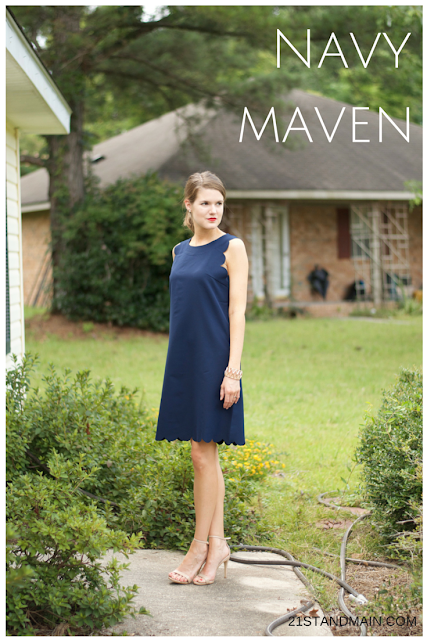 I hope you would like to join my Fancy Friday linkup! You look stunning, I really like your laser cut shirt! Oh my gosh this outfit is so pretty!! 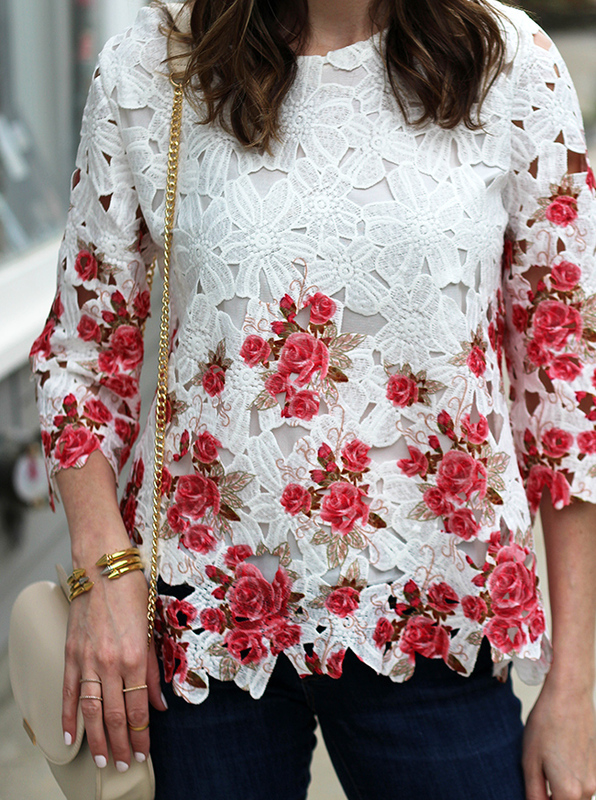 Love the roses on that top! Amazingly gorgeous top! And yes, I am obsessed with it, too. Thanks! It looks fab paired with the skinny jeans and those killer heels! Definitely a head-turner! Beautiful! SO beautiful! I love that top - the lace is so pretty! Wishing you a lovely weekend Rachael! Yes, this lace top is amazing! I love the red roses with the white. Happy Friday. That lace top is just beautiful! And perfect for the 4th! 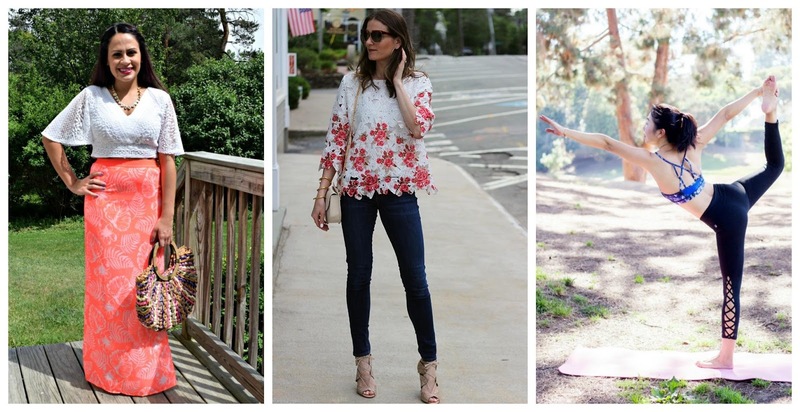 Love your lace top especially the flowers! 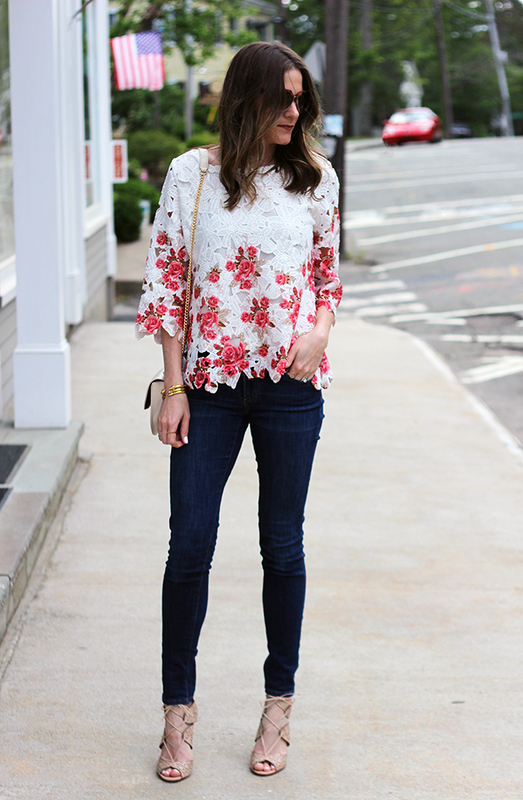 This floral top is perfect! LOVE! Obsessed with this top! The florals and the lace are so gorgeous together! That top is outstanding! Crochet and prints? Yes, please! You can't get any more feminine than this. Love it from top to bottom! This is such a pretty and unique top! Wow that top is gorgeous! Love your shoes as well! Such a pretty, feminine look. This top is definitely super cute! I love your lace up heels too!